I was honored to be Vicki Davis’s guest on the 10 Minute Teacher Podcast. Vicki and I discussed one of my favorite new edtech tools for collaboration and brainstorming, the Google Jamboard app. 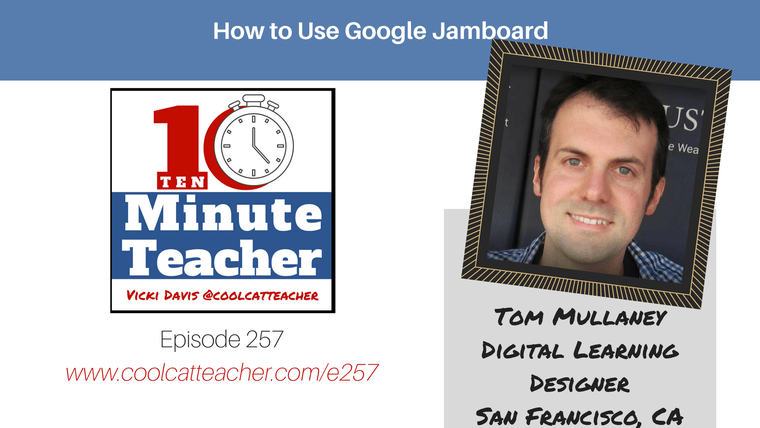 Listen to my conversation with Vicki and comment below with your ideas for using the Google Jamboard app. Hey Tom! It was so great hearing a familiar voice on the 10 minute teacher! I’m super excited to use Jamboard with my first graders as a way to share their research and learning! I’m going to use it as a way to document work on genius hour! Hey Aubrey, FYI – the Jamboard app now works for students in our district. Such a great tool! That makes me so happy! I’ve been waiting! I want to use it for genius hour! Thank you, Aubrey! What a great idea! Let me know how it goes! It was approved this fall. I just happened upon this blog post today and figured I should reply with that update.